﻿ Media | The Guardian! According to the data and stats that were collected, 'Media | The Guardian' channel has an outstanding rank and belongs to News, Newspapers categories. 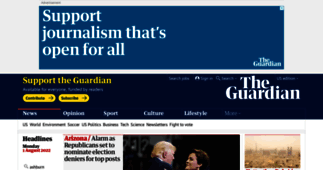 In addition 'Media | The Guardian' includes a significant share of images in comparison to the text content. The channel mostly uses long articles along with sentence constructions of the intermediate readability level, which is a result that may indicate difficult texts on the channel, probably due to a big amount of industrial or scientific terms. Long articles are widely used on 'Media | The Guardian' as elaborated and interesting content can help the channel to reach a high number of subscribers. In addition there are some medium length articles making up more than a quarter of all textual items. Intermediate readability level is common for 'Media | The Guardian' articles as it addresses the matters that demand certain level of education to be understood. Sometimes the channel gets even more difficult by issuing pieces of advanced readability level (they make up more than a quarter of all content). In addition the channel contains some materials of a basic readability level. Unfortunately Media | The Guardian has no news yet.